No magical creatures were harmed in the making of the game. They're all actors. 12 Labours of Hercules is rated 3.9 out of 5 by 83. Rated 5 out of 5 by dazzlingsunset from A lot of fun Fun-filled game for people of all ages!! Rated 5 out of 5 by Taylsa13 from Great little game! I love time management games and this one is a treat. It's reasonably fast paced and there's plenty to do. You do have to plan how to approach each level - you don't always need to upgrade every building (although I usually do as a matter of personal pride!). My only minor complaint is that it was a tad too easy even on timed mode. But for pure fun factor this really does do the trick. Off to try the 2nd one now! Rated 5 out of 5 by camilla_games from Great TM game Cool and fun game for me. Great for playing in a relaxed mode. Great visual and sound quality of the game! Rated 5 out of 5 by DanaCristiana from One of the Best Time Management Game! This game is awesome! The graphic is really good, and the story mode is excellent! 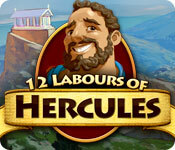 I love this kind of management game, but 12 Labours of Hercules is the Best. A game that is similar and I also loved is "Aztec Tribe". I don't know what to say more. Just play the game and you won't be dissapointed ^-^ . Rated 5 out of 5 by cowclaudia from This is a hoot With the dorkiest Hercules I've ever seen who sleeps in a hammock and lets his guys do 95% of the work and runs like he has hemorrhoids. You need to plan some strategy on this and at times not particularly easy but worth the money especially for the giggle factor. Rated 5 out of 5 by derbeader from Excellent game for fun and relaxing For me, the fun begins with the first screen-- i LOVE the expression on Hercules' face... then to find him lolling about in his hammock thru most of the game while his servants work like crazy to complete their tasks --but he makes up for this apparent laziness when he charges off to complete HIS tasks, which of course, no one else can do. Then there is the 'get the gold' factor... i've had to replay some levels to achieve the golds... challenge is good, and is why i will continue to play this game many times over. This is one game that is 'light' and still holds challenge. To explain this further-- when i want to play a game, i don't always want the same levels of challenge-- depends always upon my 'mood of the moment'... and Hercules fills the bill quite nicely. Rated 5 out of 5 by Ziggy_Zigster from More like 12 Labours of Love I LOVE this game! 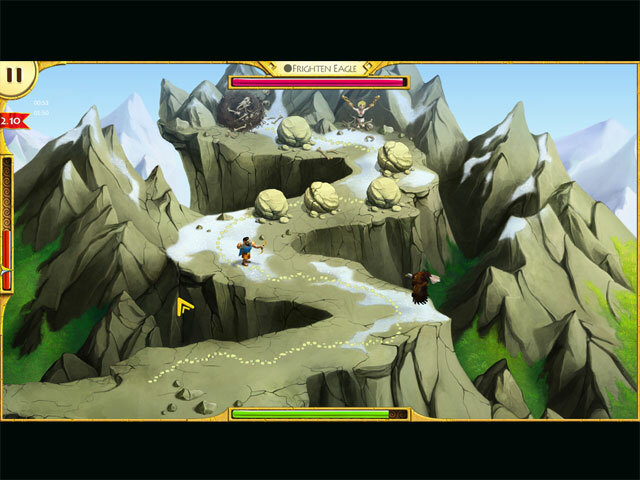 You have a number of different sceneries as well as some really cute mini-games. You can't play the game un-timed, but IMO you won't need to. 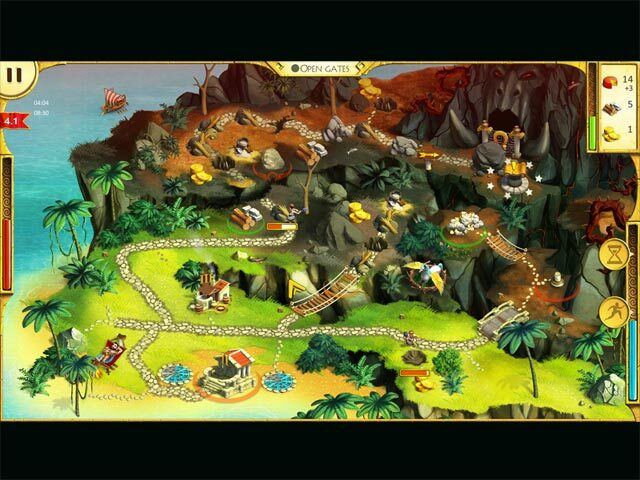 The timer is more along the lines of 'Island Tribe' and 'Royal Envoy' in that the levels are challenging but not too challenging. Aside from that, it's basically along the same lines as other TM games. You collect items to complete actions and so forth. There is an achievement system and you may have to replay some levels a few times over to complete the game but it's a fun game. Rated 5 out of 5 by JB4510 from The only game that comes close to Roads to Rome Really good, addictive strategy/time mgmt games are hard to find. I honestly can't explain why I instantly fell in love with Roads to Rome when others such as the Kingdom saga make me feel like I'm on a bad date. If you prefer RtR to other games lumped in the same category, then this is the game for you. I love the tasking, (but you have to be smart about it), bonuses, and achievements. I particularly love the fact that Expert Mode means Expert. I had to play almost every level more than once, some for days, to achieve gold in Expert Mode. The only thing I didn't enjoy were the mini-games between chapters, but they were minor annoyances. I really hope a sequel or similar game by the same developers comes out soon.